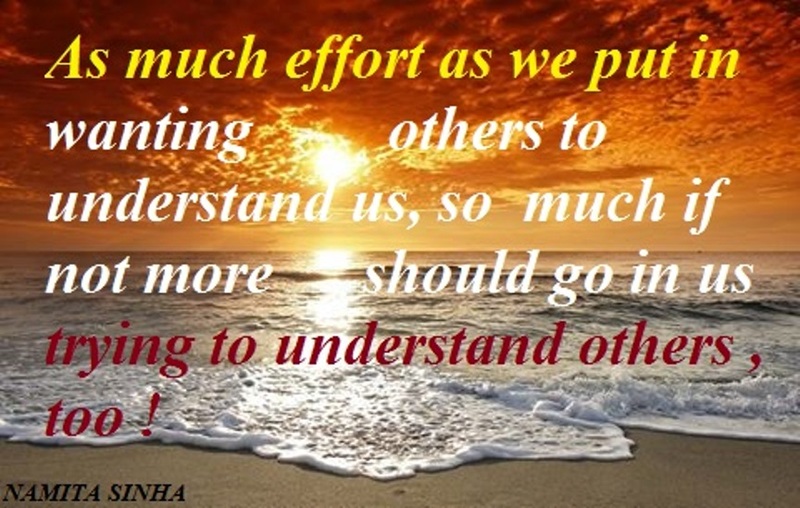 The Dove's Corner: Somethings that Matter - # understand others ! We really want to be encouraged by those we think matter, so much that we sometimes lose sight of others and we lose sight of understanding why people behave and things happen, the way they do. In order that we avoid the grave risk of falling off track and disturbing ourself severely at mental and emotional level, we must acknowledge that times change and people change. We need to understand that things aren’t always going to be like they were. 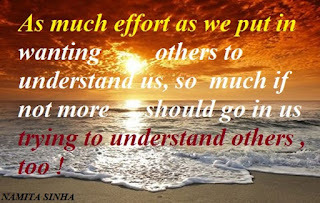 Once we pause and begin to understand others, it really puts things into perspective that one can still maintain friendships and relationships …with less chaos and expectations; albeit more joy, peace and harmony ! Apply this to your own situation and relate it with your own relationship dynamics be it with your family, friend, relative or at the workplace - with your boss, colleagues, clients, customers, suppliers…or whoever. At some point, it shall make sense , very much ! Dedicated to your success and happiness, - ”Somethings that Matter” is a series of posts and quotes from me mentioning my thoughts and learnings towards personal and organisational behaviour , that may find a connect with you !